It’s been said that the biggest players save their biggest plays in the biggest games. And they don’t come much larger than the record-setting, offensive inning that Alex Rodriguez had for his World Series-bound New York Yankees team on October 4, 2009. After hitting a three-run shot in a game against the Tampa Bay Rays to give his team a 3-2 lead in the sixth inning, he capped a 10-run inning with a towering grand slam sending the Yankees Nation into a frenzy and another one of his achievements into the record books. 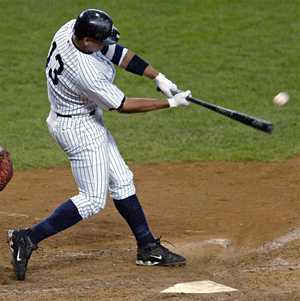 “I didn’t even realize at the time that it was a record-setting hit,” A-Rod said around a broad post-game smile. “I was just caught up in the momentum of our huge inning. It’s great to keep things going heading into the playoffs.” The previous AL record of six RBIs in an inning was accomplished 12 times; most recently by Boston's David Ortiz on Aug. 12, 2008. 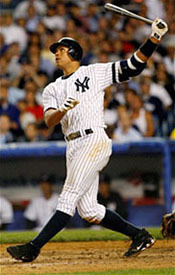 A-Rod entered the game with 28 homers and 93 RBI, leaving him likely to come up short in his bid for a 13th consecutive season of 30 home runs and 100 RBI. In the sixth inning, he came to bat with two base runners aboard, and hit the first pitch off Wade Davis to deep left field, scoring three runs and bringing his annual total to a respectable 96 RBIs…but he wasn’t finished yet. The Rays brought in reliever Andy Sonnanstine before Rodriguez came up for the second time in the inning with three more runs having scored and the bases loaded after an intentional walk to Teixeira. With two outs and a 0-1 count, Rodriguez hit a grand slam to deep right center. The blast game him seven RBIs for the inning, setting the American League mark, and also claimed him an MLB record of 13 consecutive seasons with 30 homers and 100 RBIs, breaking a tie of 12 seasons in a row with Jimmie Foxx. The long ball also moved him into a tie with Mark McGwire for 8th on the career list with 583 homers. Editor’s Note: On September 6, 2010, Rodriguez tallied his major league record 14th 100 RBI season with a solo homer in the fourth inning and a sacrifice fly in the sixth. Rodriguez had been tied with fellow 500HRC members Babe Ruth, Lou Gehrig and Jimmie Foxx, who posted 13 seasons of at least 100 RBI during their careers.